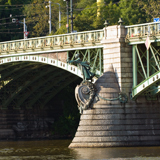 Čechův Bridge is the tenth and the shortest bridge over the Vltava River in Prague. The bridge was built between 1905 – 1908 by engineers Jiří Soukup, Václav Trča, František Mencl and architect Jan Koula. Originally, it was a part of the project creating the Prague inner ring road. Construction of the bridge was also connected with the clearance of the old Jewish ghetto. The bridge connects the Letná Park and the Prague Jewish Quarter, where the Old-New Synagogue is located. The bridge is remarkable in that it is the only Art Nouveau bridge construction in the Czech Republic that reaches such proportions. It is most noteworthy for its unique artistic decoration. The tops of the columns are decorated by 4 bronze sculptures by Antonín Popp. Each column bears figures of genii. We can find the six-headed hydra figures guarding the coat of arms of Prague on the downstream side. 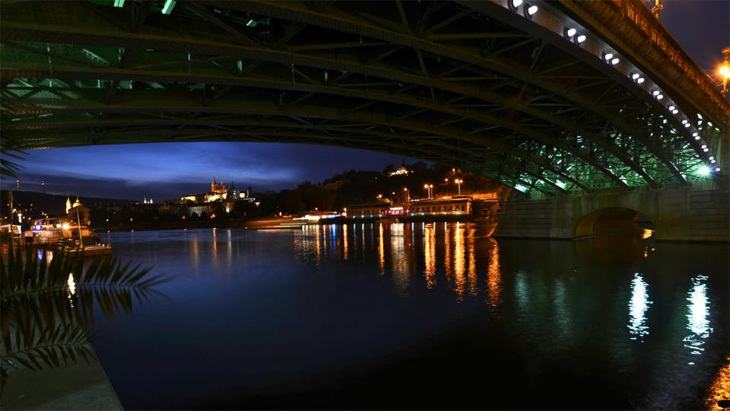 The bridge was named after a Czech writer, journalist and poet Svatopluk Čech, who is probably best known for a satirical novel series of The Excursions of Mr Brouček of which some were used of Leoš Janáček operas. There are hourly and two-hour cruises from Čechův Bridge as well as cruises with dinner or lunch. 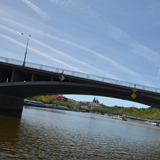 Štefánikův bridge is the eleventh bridge on the Vltava river if you count downstream. It connects the Revoluční třída and the Letná tunnel with which it serves as a constructional and communicational unit.